If you use Slack internally, like any other company, you have likely ran into message saturation from being part of many channels and group direct messages. Conversely if you are the one who answers questions in a specific channel, this likely takes up at least 10% of your time. I proposed a product solution of a Slack Bot that measures the value of your collaboration, through helping your peers over Slack, in a quantifiable way. The idea is to count how many emoji reactions your posts get and either increment or decrement your karma score. This karma score is then compare and contrasted with every other person in the company similar to such schemes in Reddit or StackOverflow; it gamifies the internal collaboration often taken for granted or misappropriated. Slack provides a connection to any of its clients via Real Time Messaging (RTM) API for embedding real time chat functionality within clients. This WebSocket based API lets you programmatically send and receive events to Slack in real time. Events can be new messages in a channel, new channels getting created, or even having a new user join the Slack team; this all gets continuously streamed to the websocket connection for the bot to process. The websocket connection uses JSON for requests and responses, and uses OAuth2 for authentication. We use nlopes’s Slack API because it easily wraps all the convenience methods Slack’s SDK gives out for free to Node and Python. RTM together with the SDK is the basis of the Slack Bot. We have a stream of data coming from RTM which we process and then use the SDK to do a certain action (to Slack). But let’s back up a little bit and talk about where this integration lies, the bot user. 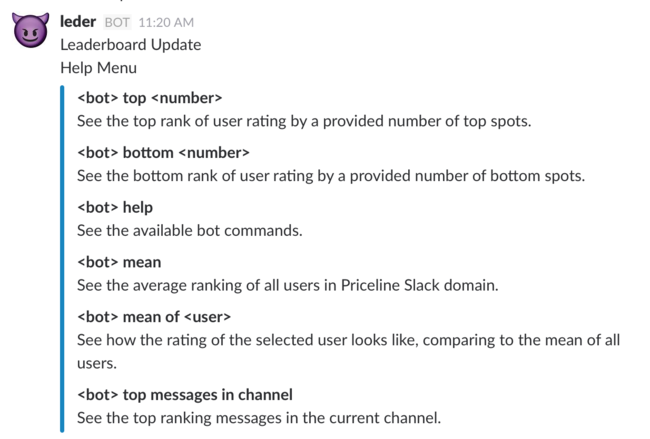 Bot users allow “real” Slack users to interact with external services. The external service in this example is the Go code running in some box, local server, or whatever. You can create new bot users using your Slack’s team settings page with the appropriate access rights. Theres a slew of actions bot users can do from monitoring and processing channel activity to posting messages and reacting to users. The important thing to note is the token which is associated to each bot user. The token is given to you after you created the bot user, you can provide fine grain access rights for the bot user through its token. This token allows your external service to interact with your specific Slack platform through Slack’s API and opening an RTM connection. I’m going to break down how we tackled creating the Slack Bot from connecting to the API to replying to “real” user commands to the Bot. Connecting to Slack’s API is simple with nlopes’s Slack API simply create the Client with the token from the Bot User (this should be abstracted out of the logic since leaking this token could potentially lead to a lot of security issues). After the api client is created we just create a new RTM instance and let Go handle concurrency issues by spawning a go channel through the API. Above we have some basic events that we need to listen for to handle the functionality the Slack Bot provides. Upon connection we need to load in all the users of the Slack domain and then afterwards add in to our in-memory understanding whenever there are new users to keep track of each others karma score. Now that we have an RTM connection working, we need to pass in event actions to the respective handlers. Not to go through the entire code base but here is an abbreviated channels we created to handle the Slack Bot’s actions. Here is an architecture point we should highlight. A Go Channel is a typed connection/plumbing through which you can send and receive typed payload using the channel operator <-. This allows our Slack Bot to effectively handle incoming messages in real time and still keep state in a simple built-in manner that Golang provides us. So then inside the MessageEvent case (some code removed), we obtain the channel where this message was produced and parse the string to see if it is a normal message or a bot command. When the bot user is mentioned Slack uses a pattern such as <@8675309> to identify a certain user (or bot user). So a message like “@chrisbot hey do you like harry potter?” would be received as <@19800731> hey do you like harry potter? with 19800731 being the bot id for chrisbot. We handle a bot request different from a generic message to the channel since we produce some actions based on the keywords provided. When handling reactions, we had to first find out if an emoji is positive or negative. This gives us a problem since it would be cray cray to hard code every single emoji while a thumbs down emoji should hardly be an uptick in that user’s karma. The quick and dirty fix we did was merely naming a select few emojis as negative and defaulting all the rest as positive. Above is an example of the action taken when an emoji is positive. isAdded is a configuration flag passed to denote if an emoji is being added or removed. This way we had some sort of DRY-ness into our logic. As we’ve gone over Step 3, if the message received is a bot command we let it run through a different flow. Here we utilize the botReplyChannel created in Step 2 to pass in what the bot should reply. We need to let it know which channel, what text to say, and if there are some attachments provided. Above is a snippet for the help case where the user is looking to see what commands we have. We first create a Slack AttachmentField using their SDK, then fill in the values needed such as Title, Value, and the attachment itself. Afterwards we send this attachment to the botReplyChannel for the goroutine to then post it to the channel when it has the time (remember its a lightweight thread managed by the Go runtime). Since this is a PoC, we never bothered to handle what happens if the server crashes or if this server runs in perpetuity (we’ll run out of memory). These are all next steps to making it a full fledged bot to deploy in a cloud instance. We have however handled what happens when a new user joins the domain. This lowers the total average score of the team as well as adding the new user to the bottom ranking (if there are no negative contributors). Another tricky part we handled is having the bot user be completely configurable outside of the Slack Bot. That is, we parse the name from configuration as well as its id; all done dynamically. As hackathon PoCs go, we will always have some sort of scope creep from feature requests or new avenues discovered at the last hour of the last day of the hackathon. We were not an exception to this rule, as having internally demoed our product before we present it to the judges, a feature request popped up on showing the top messages in the channel (most upvoted or reaction-added). So here we had to bootstrap a messages in-memory data structure to keep track of what was the message and how many karma points that message got. When a reaction is added we go through the data structure to increment or decrement the rating of the message found (or otherwise we store this new message if it is new and give it a default score of 0). As previously mentioned, the full source code is available on GitHub and was open sourced with an MIT license on October 7, 2016.